Capt. John runs the "Cheerio Lady", and she is a fully customized 40' fiberglass sportfisherman. She is powered by a single 430hp Volvo Marine Turbo Diesel. Her large cockpit and high sides make fishing easy and comfortable. Down below, there are 6 bunks for those that are tired from a long day on the water, and a toilet! She has a full complement of safety gear and the latest in navigation and fishfinding equipment. Top of the line custom rods and reels are provided for every trip..
Trolling for Spanish Mackerel and Bluefish in the near shore waters (3 mile Range) off Carolina Beach, NC. 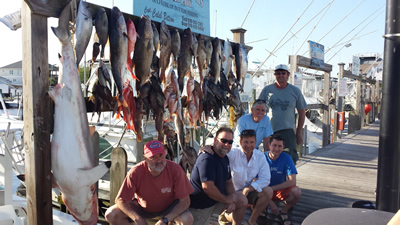 This is a great way to introduce Saltwater Fishing to the whole family. If you are looking for a way to introduce your CREW to the Offshore world the 1/2 Day near shore trip is the way to go. This is a great time for the whole family. 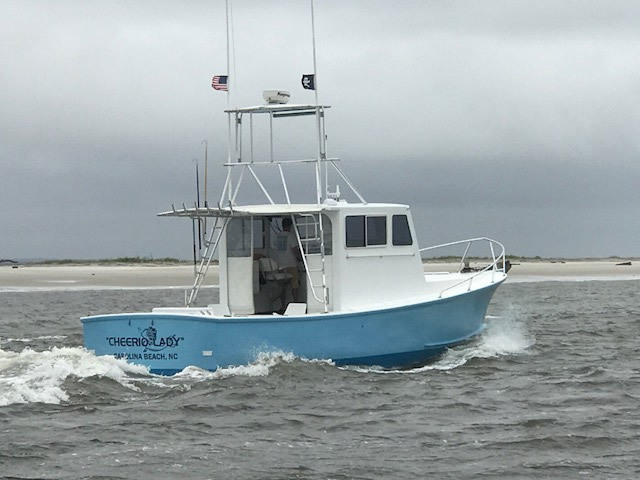 Trolling for King Mackerel, Cobia, Barrcuda and Mahi (In Season) among the Offshore wrecks, Artificial Reefs and live bottom in the offshore waters of Cape Lookout. This is a great trip for your first offshore experience. Trolling - Mahi and King Mackerel are the mainstay of this trip. During the right time of year the catches can be quite large. Bottomfishing - Now we have some time to work with. 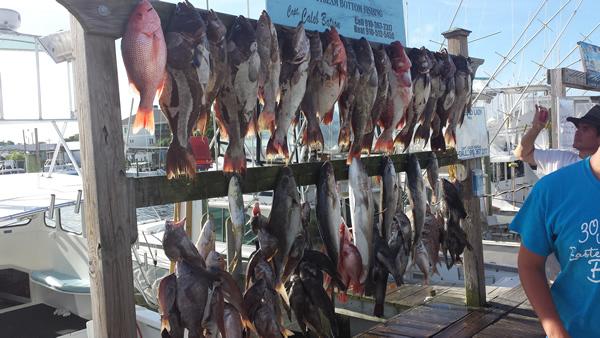 Beeliners and Grunts are the mainstay but what we are really looking for is Grouper. We often limit out on most species on these trips. Trolling for Wahoo, Mahi Mahi, Blue Marlin, White Marlin, Yellowfin Tuna, Blackfin Tuna and King Mackerel in the crystal blue offshore waters of the Gulfstream along the Crystal Coast. Wahoo is a year round fishery and In Season the Mahi fishing is "Off the Hook". This is the trip dreams are made of...so come join us for an experience of a lifetime.